MarketDelta Trader is a powerful, easy to use trading platform that can be run stand alone or connected to MarketDelta Charts to provide a seamless data and trading interface. Leverage all the powerful and unique tools MarketDelta offers, automated trading, and save money on data costs. Many times the edge a trader possesses lies in the simplicity of use and design. The features of MarketDelta Trader have intentionally been kept simple and easy to use and leverage increased transparency by technology and design.Trading is hard enough, why should software be too? It's free, so give it a TRY! What is a Footprint Chart? The Footprint® chart is revolutionizing real time price transparency by displaying price AND volume activity and adding color to signify the dominant order flow at that point in time. Blue represents more aggressive buyers; red represents more aggressive sellers. The darker the shade of color the more dominant the order flow at that price. Having this information at the point of execution is an invaluable because it shows the imbalances the moment they occur. 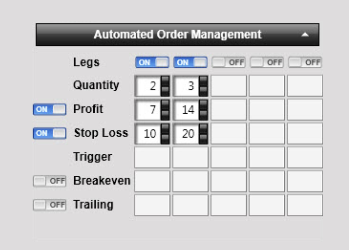 The Footprint is a built in high frequency trade tracker because of how it displays the information, keeping you on top of the markets no matter what the condition. Bid Ask Footprint® This takes the volume and runs it through our order flow classification algorithm to determine if the trade was buyer motivated (traded at ask price) or seller motivated (traded at bid price). It is displayed as bid traded volume x ask traded volume. 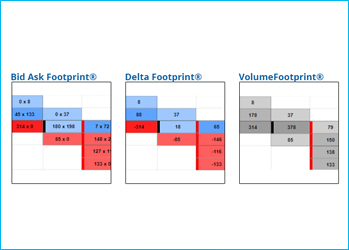 Delta Footprint® Delta is the difference between bid and ask traded volume. The calculation is ask traded volume - bid traded volume. It will be either a positive or negative number. 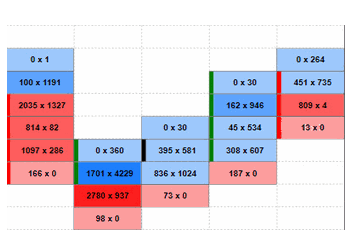 This Footprint type gives indication of the direct order flow coming into the market as buyers and sellers react. The value shown is the net buy or sell volume at each price. VolumeFootprint® Displays the total volume traded at each price for the interval chosen. Good for monitoring how much volume is truly occurring and at which prices, as well as showing how much volume is trading at extremes. Use Demo account with live data for training and simulation Automate up to 5 legs at once.